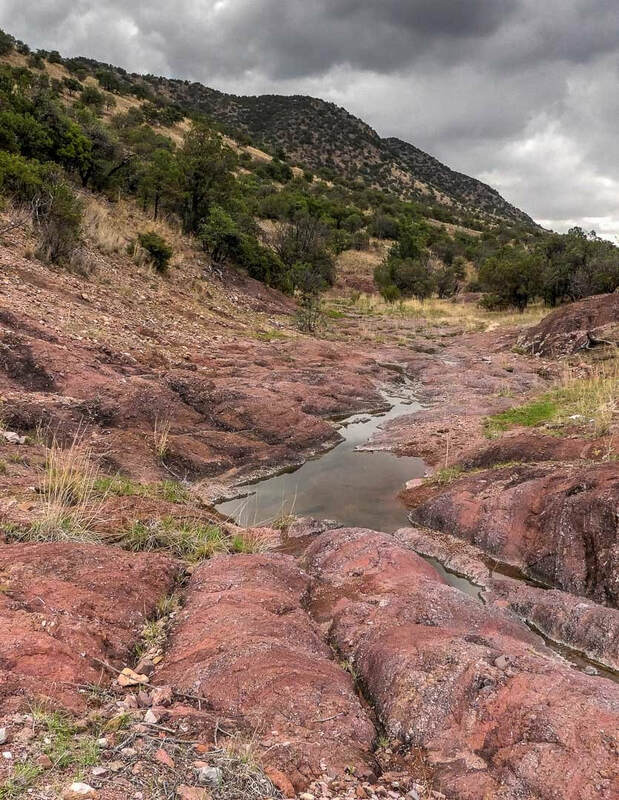 The Sierra Vista District of the Coronado National has proposed construction of a livestock exclusion fence around Sycamore Spring on the Lone Mountain Allotment. A new fence about 1¼-miles long would tie into an existing pasture fence. The area excluded would be approximately 80 acres, including the perennial portions of ½-mile of stream bottom. Wildlife-friendly fence standards would be followed, also. Sycamore Spring is located on the southwest flank of Lone Mountain in the upper reaches of Sycamore Canyon. The predominant vegetation on the adjacent hillsides is Oak-Juniper Woodland. Elevations range from approximately 5600 feet in the bottom to 5800 feet on the upper slopes. Sycamore Canyon flows into Joaquin Canyon, which in turn feeds Cave Canyon. Cave Canyon eventually crosses into Mexico before meeting the upper San Pedro River. John Millican, Bruce Nunes, and Tom Deecken of the Board conducted a field analysis of the proposed exclosure on July 16th, 2018. Our hike included the Sycamore Spring area inside the exclosure and ¼ mile of the canyon above and below. We visited nearby Mud Spring as well. The lower ⅓rd of the bottom within the proposed exclosure is mostly exposed bedrock with seasonal pools and flow. Scattered Deergrass and Seepwillow was noted along with a Sonora Mud Turtle. In the remaining ⅔rds (to the upper end of the exclosure) there is a mixture of mostly saturated soils with perennial pools and flow, exposed bedrock, and sediment deposits. Deergrass, Giant Sedge, Watercress, Juncus, Arizona Sycamore, and Willow are more prevalent. A more closed canopy of Aligator Juniper, Arizona White Oak, and Emory Oak occurs, also. 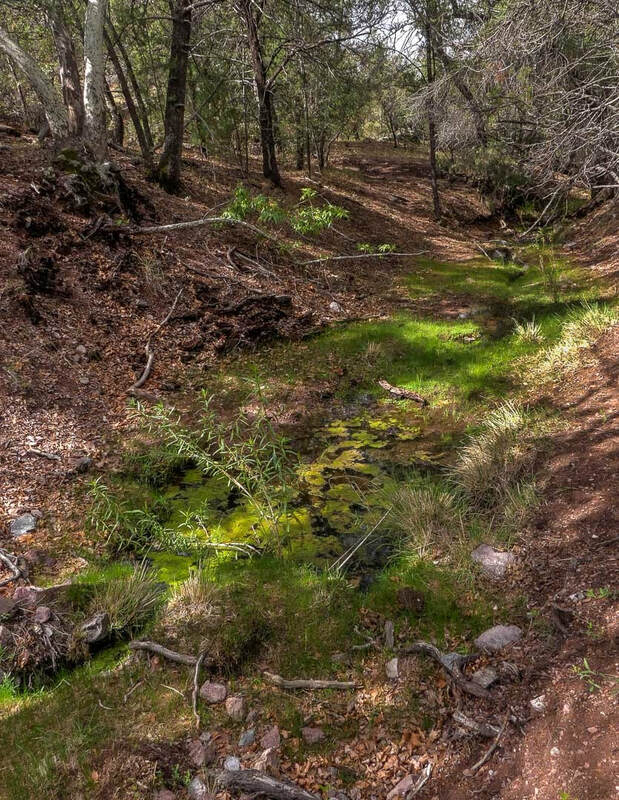 Within the upper portion species of special interest observed were Huachuca Water Umbel, Chiricahua Brookweed, Giant Sedge, Green Sunfish (numerous adults and smaller age classes), probably 3 or 4 adult Chiricahua Leopard Frogs, and 2 Elegant Trogons. Previously recorded Long-fin Dace could have been overlooked; however, if present this species would have been in very low numbers. Turkey sign has been seen in the past, also. Heavy use by livestock in the upper 2/3rds portion of the bottom was very evident. Down cut banks and grazed Deergrass and Giant Sedge were very noticeable. 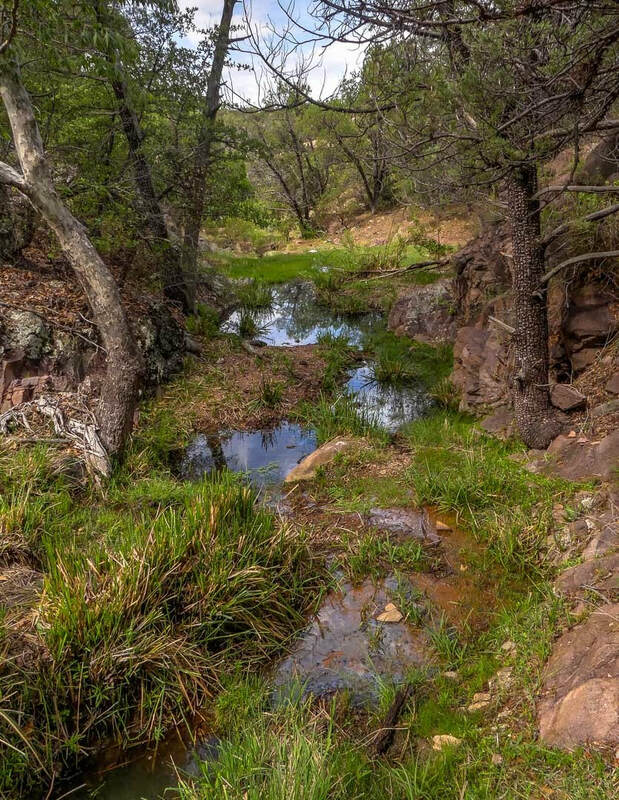 Habitat for Gould’s Turkey and other wildlife would benefit from better riparian conditions at Sycamore Springs. Specifically for Turkeys these conditions include more spring greenery and insects, improved channel and bank stability, and possibly more extensive water. Nearby Mud Springs was visited the same day. While a somewhat different type of wet area (perched natural spring feeding a small pond), it does offer an example of improved vegetative conditions for Deergrass and Giant Sedge. These improved conditions should occur within the proposed Sycamore Spring exclosure. Mud Springs was fenced to exclude livestock and Bull Frogs several years ago. 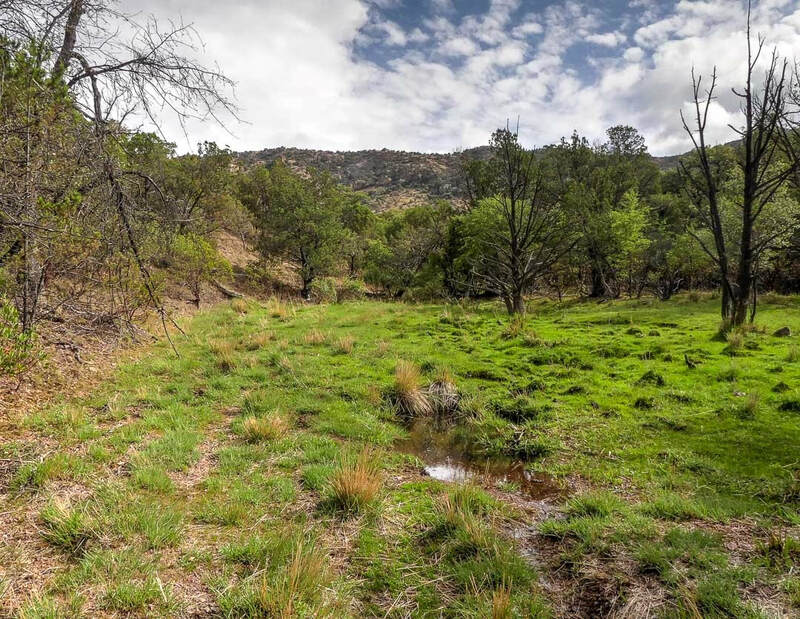 The Board of the Huachuca Gould’s Chapter should support construction of a livestock exclusion fence around Sycamore Spring. 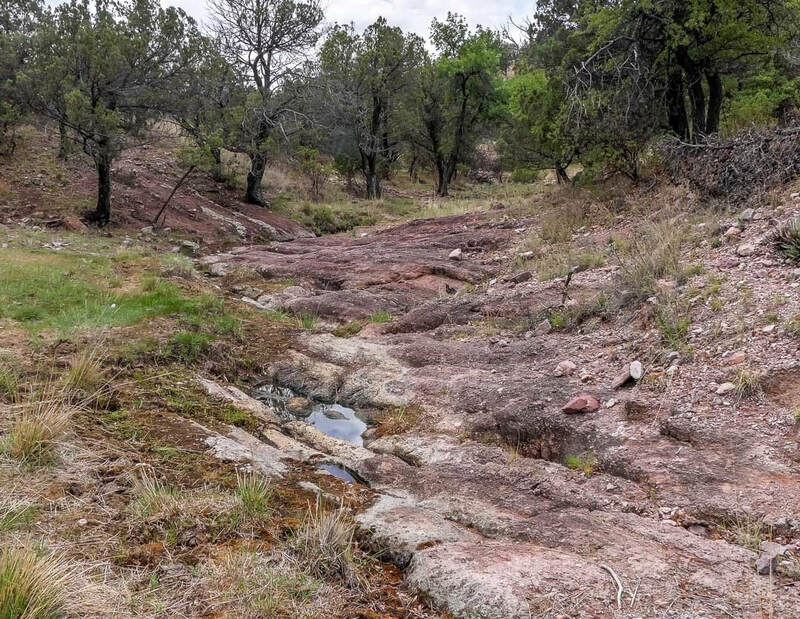 Livestock use, if permitted within the exclosure, would probably be very limited in duration and adhere to standards in the Coronado National Forest Resource and Land Management Plan for forage utilization, stream bank and channel stability, and water quality. Fencing materials could be provided by Huachuca Gould’s Chapter. Some of those materials are stored at the Chapter’s Carr Barn facility. 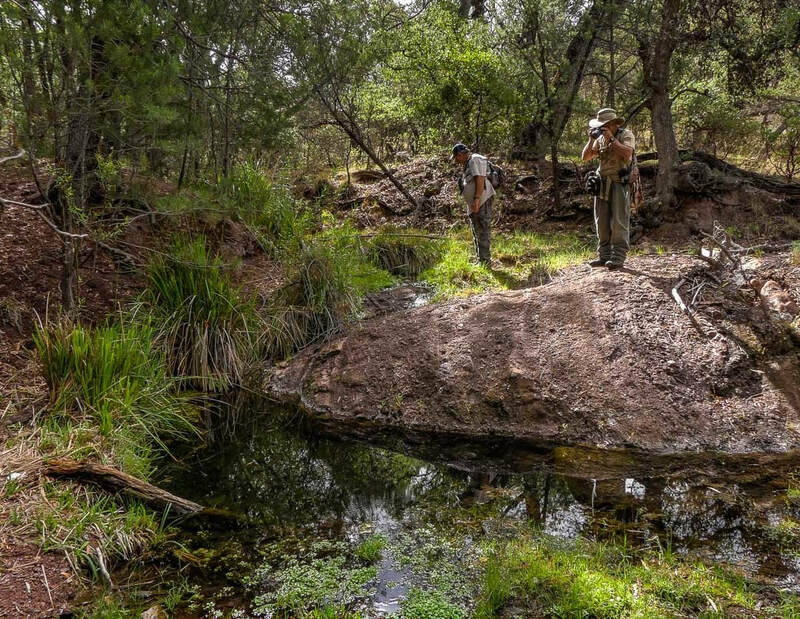 Additional materials could be acquired with grants from the Arizona Game and Fish Department and the State Chapter of the Wild Turkey Federation. The Chapter could act as a purchasing agent for these materials. Included in the design of the exclosure fence should be at least one walk-over for visitor access, probably somewhere in the lower end. Permanent photo points should be established to record response as well. A time frame for completion of NEPA documents is needed from the Forest Service before the transfer or purchase of materials. This time frame is needed for grant applications, also. A location map and site photographs are found at the end of this document. No images are included for Way Point 5. It represents the upper extent of our hike in the stream bottom. Above Way Point 3. Bruce Nunes (left) and John Millican watching Green Sunfish in deeper pool. Livestock Ex-closure at Mud Spring. Giant Sedge and Deergrass occurs along edge of pond and in spring area (lighter color). This growth illustrates potential cover following construction of the proposed livestock ex-closure. Mud Spring is located about .6 of a mile to the east of Sycamore Spring.